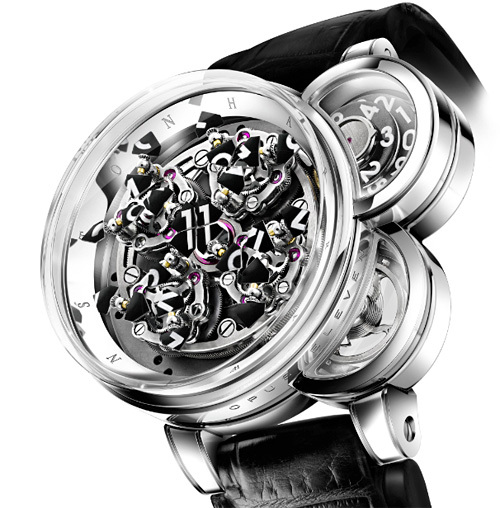 Harry Winston's Opus Eleven Watch Is 110% Eye Candy | OhGizmo! By Andrew Liszewski on 03/31/11 • Leave a comment! Some watches pack more functionality and computational power than the early Apollo missions, while others are simply designed to look good strapped to your wrist. Harry Winston’s new Opus Eleven falls into that latter category, even if it looks as complex as the rockets that took man to the moon. The watch’s main face looks like it could tell you everything you ever wanted to know, short of predicting the future, but the complicated array of gears and placards basically only serve to display the hour every 60 minutes. But in a spectacular fashion that is sure to have the wearer’s rapt attention at the top of each hour. It’s another one of those things that’s far more impressive to see in motion, and thankfully Hodinkee managed to get some video of the Opus Eleven at Baselworld 2011. It’s enough to make even the most passive of watch enthusiasts scream “WANT!” were it not for the watch’s base price of $230,000, more if you want it accented with diamonds.